While my absolute favorite thing this week has to be the snow, it’s not the most shareable thing. Also it was several thousand Atlantans LEAST favorite. I’m thankful to have been able to stay home both Tuesday and Wednesday safe and sound with my family. It’s horrible how many people were trapped, especially the children in schools. I’m hoping they’re all safe! I’m linking up with Nicole and Katy and sharing my favorites again this week. My favorite thing this week combines two things I think are full of fantastic ideas: Designs by Nicolina and subscription boxes. 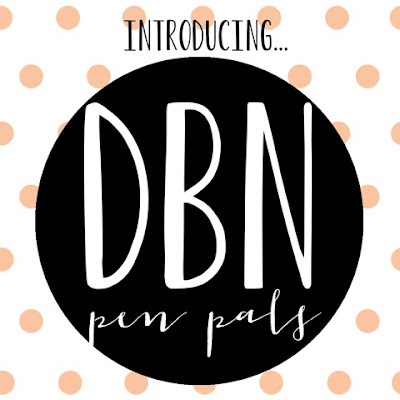 My friend Nicole introduced a new way to satisfy your paper needs on Monday, DBN Pen Pals. Each month you will receive about $25 worth of paper pretties from the Designs by Nicolina shop. It could be a combination of recipe cards, greeting cards, thank you cards, art prints, the list goes on! You can get a one, three, six, or twelve month subscription to ensure that the beautiful designs make it to your front door! If you get in on the ground floor before February 1, shipping will be included in the price of your box for the length of subscription that you choose. If you ship anything on a regular basis, you know how amazing that deal is. I’m really excited to get my first subscription box around February 15! Hurry up so you can get your first DBN box when I get mine. So link up with Nicole, Katy, and me and let us know what you’re favoriting this week. 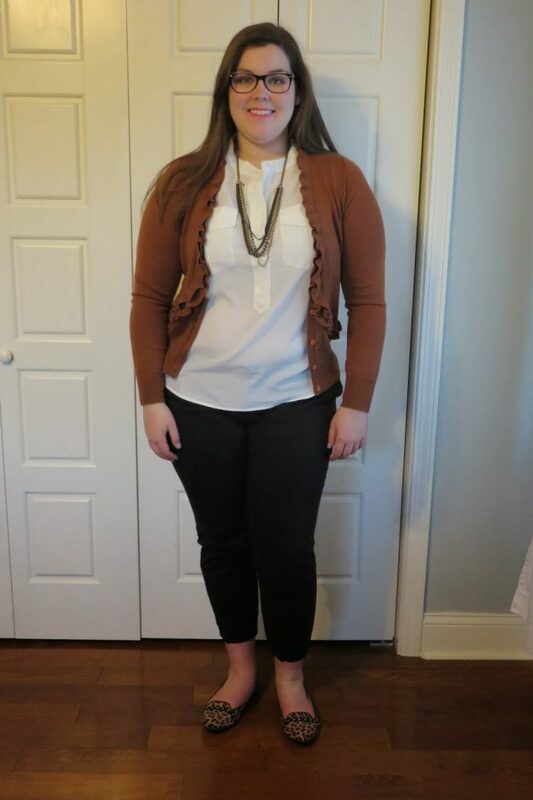 Cafe Capris from J.Crew are my all time favorite work pant. I know many gals like the Minnie, but the cut and fabric do not work well for this pear shaped gal. 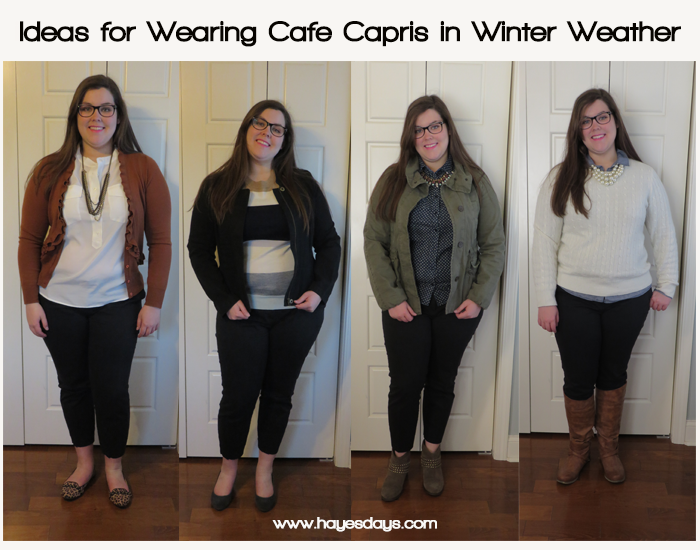 The Cafe Capri was perfect for me, until we had this unseasonably cold winter here in the south. And it looks like we’re not quite done with cold weather yet! Wearing the cropped pants with bear ankles in 30-40° weather wasn’t working out. I started testing silhouettes with warmer shoe options over the past few months, so this post has been a long time in the works! These are all outfits I’ve worn before and in the temperatures I recommend them with, so they work for me. I run a little hot, so adjust your picks for your normal body temperature. After doing this, I have a whole new appreciation for outfit and fashion bloggers, especially those that take their own pictures. You are now among the ranks of heroes for me. This was hard, to say the least. Arguably the best looking shoe with cafe capris. 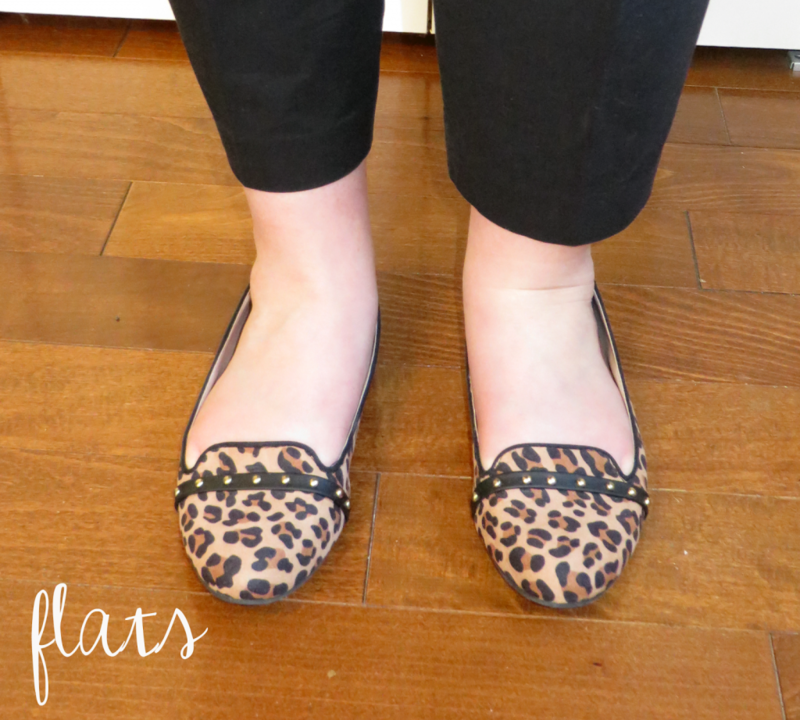 The issue I run into with flats with my body shape is keeping the bottom half balanced out with the top half visually. 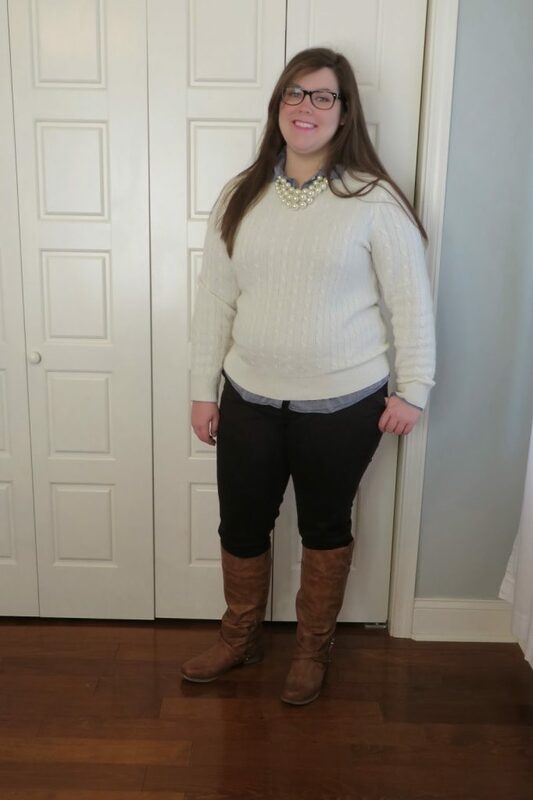 I chose a light weight top and a cardigan over it, so it doesn’t look overly heavy on top. Maybe it’s just my eyes, but I think that the patterned flats also play a visual trick in this balancing act. Most of the time, a variation of this outfit is what I’m wearing to work. I got them at TJMaxx/Marshalls. They always have a wide selection. They’re padded, warm, have grippies in the toe and heel to keep them in place, and work much better with heels for me, and I’m mad I can’t remember the brand. Check out your options here. They’re also called slipper socks and toe socks. I haven’t found a pair that works well with flats yet. (If you have let me know! It would make my flats outfits much warmer!) 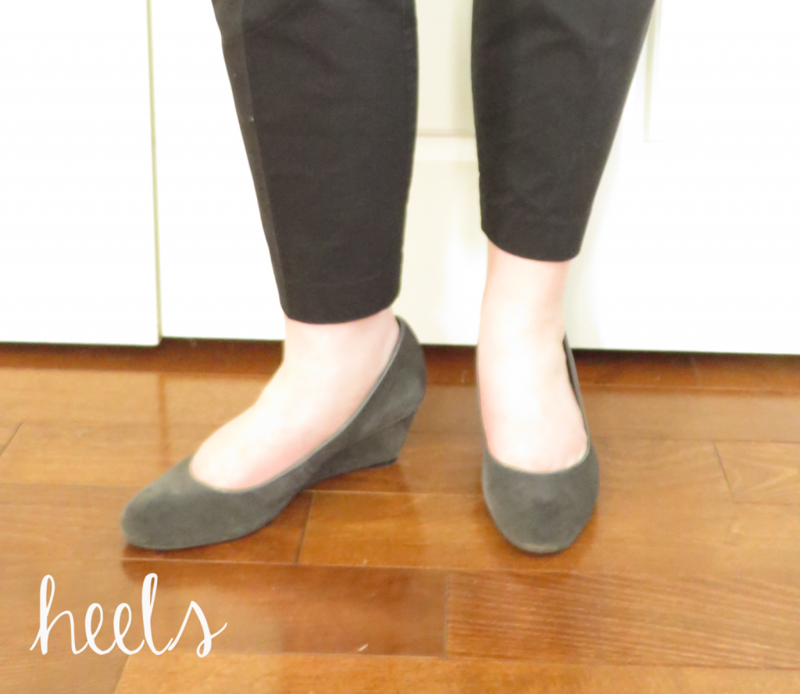 Also, heels make your legs look longer, so you can go a little bulkier with your top half by adding more layers. 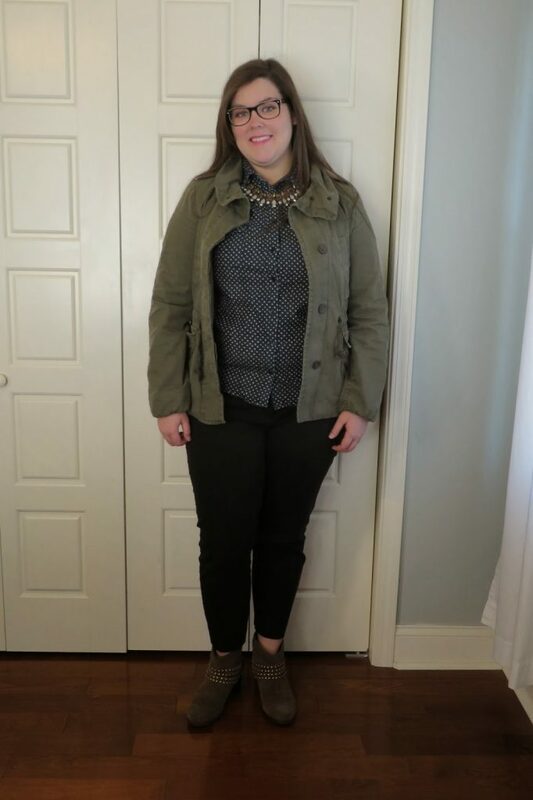 I chose a 3/4 sleeve light weight sweater (a Tippi to be exact) and a medium weight jacket that can be removed if your work environment is warmer or put on if it’s cooler. Now we’re getting warmer, especially if it’s not windy! This is not a look I naturally go for. It’s a little heavier looking than what I usually wear, but it’s warm and this has easily become my favorite combination. These booties, in particular, make my feet look visually heavy, but the short shaft hides socks. I can wear thick workout or even short wool socks from sporting goods stores and keep my feet REALLY warm with these booties. (No more bare feet shots of my socks. You’re welcome.) 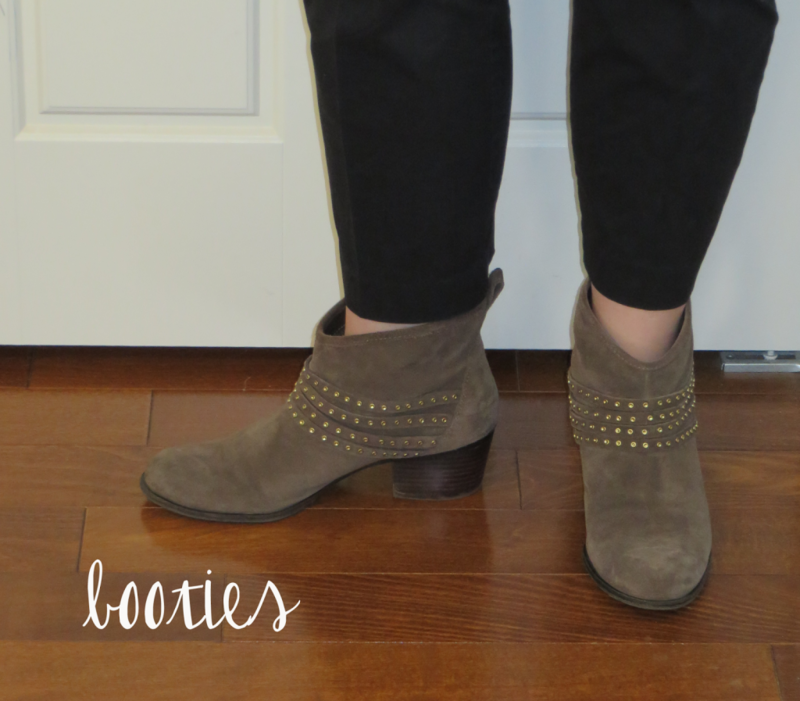 This particular style bootie limits my tops to a more casual look. Thankfully, this outfit is appropriate for my office. I have yet to find a bootie with this length shaft that looks dressy. The riding boot is the most polished boot option that I feel works well with the Cafe Capri. I’ve also done Western style boots with my Cafe Capris, but I can’t get a work appropriate combination with those boots. 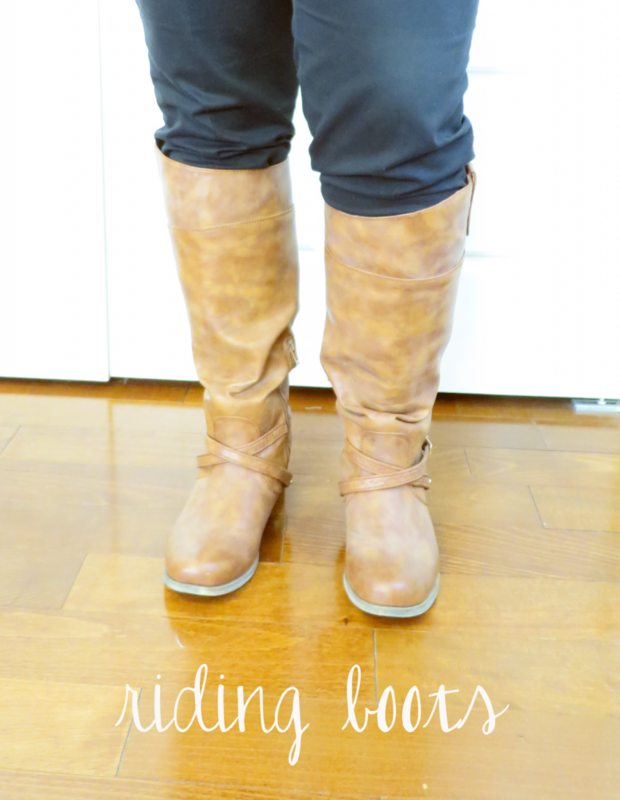 The riding boot covers up any ankle. It’s best for windy days. I wear tall trouser socks and tuck my pants into them so they don’t bunch up in the boot when I’m walking. This pair makes my legs look a little longer than other pairs I’ve tried, due to the fact that they are knee high, so I feel like I can layer more on top. 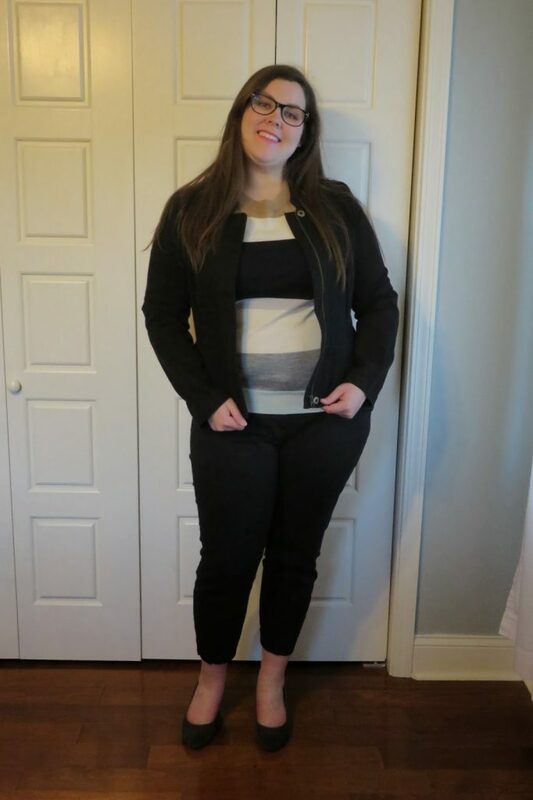 I’ve done this particular outfit (plus gloves, hat, and heavy wool coat) in 35° weather and it works for peeling off layers in the warmer office and still being comfortable. While this may not be office appropriate for your work environment, this is the warmest option. I think your best bet if the weather is this cold and you still need to be office appropriate is to put on heels when you get there. For the past two months, I’ve been putting together variations of these outfits. 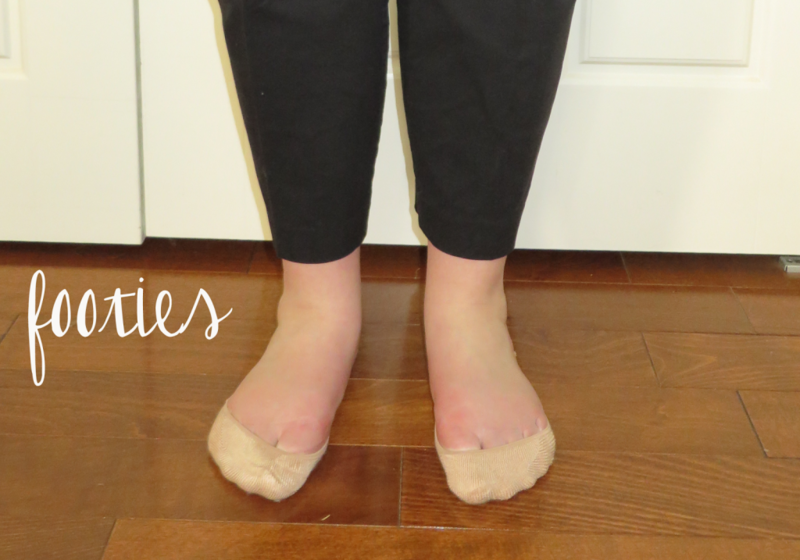 How have you been transitioning your Cafe Capris into cooler temperatures? Have you found booties and boots that are better for your work? I have a lot to share from my most recent Disney trip. To try and not overwhelm, I’m going to break up all the information. First, let’s talk about Magic Bands. I’m going to relate my interactions with them in an effort to help others as they plan for their trips. If you have any questions about how Magic Bands will impact your next Disney World vacation, use my contact page or comment because I would love to help! During our September trip, Magic Band testing was already in full swing, but not happening at the resort we stayed at. Still, I was doing as much research on them as I could. Now that Magic Band testing has been rolled out to every resort, my family had the chance to experience them. I’m going to cover this in three stages: before you go, while you’re there, and a short back home post. If you’re completely unfamiliar with Magic Bands, they are Disney’s new technology replacing tickets, room keys, and paper fastpasses. To date, they’re still in testing and they’re just testing for resort guests at Walt Disney World, no Disneyland yet. Customize them online: You have seven colors to chose from and you can even put nicknames on them, not just your name on the reservation. (i.e.- the inside of my blue Magic Band said “Belle.”) I’ve seen people get really creative with their Magic Band names. The customization window opened already for my September trip, so you have plenty of time if you’re booking more than 30 days out. If you’re booking less than 30 days, you’ll get the gray Magic Bands at check-in. Don’t fret, you can customize those gray ones while you’re there. FYI, those precious Magic Bands are Next Day Air shipped to you when the customization window closes via UPS with a guaranteed 10:30 AM arrival time. 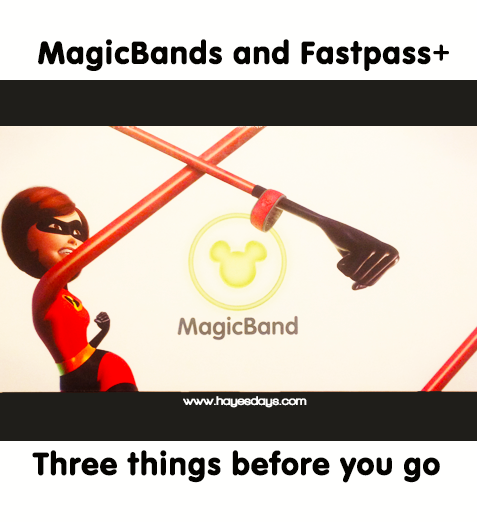 Make Fastpass+ reservations: Go ahead! Get those coveted Toy Story Mania fastpasses! There are a few things to note about this process. You cannot pick from more than one park each day. You have to choose three (you don’t have to do all three though). EPCOT and Hollywood Studios are what Disney is referring to as “tiered.” Being tiered means that the Park attractions and experiences have been split into two groups that are essentially the popular attractions and the not as popular attractions. At this moment in time, Animal Kingdom and Magic Kingdom are thankfully not tiered. The rides that were hard to get paper Fastpasses for are also difficult to get Fastpass+ reservations for, especially that same day, so go ahead and make a few reservations, just so you have something. Example of tier: At EPCOT you can choose one experience from this list: IllumiNations preferred viewing spot, Malestrom, Soarin’, Character Spot, and Test Track. You can then choose two from this list: Mission: Space, Spaceship Earth, The Seas with Nemo and Friends, and Turtle Talk with Crush. Update or create your family and friends list: If all of you want the same Fastpass+ reservations, you all need to link existing MyDisneyExperience accounts or create a guest. If the friend or family member has an account linked up or you manage one for them, you have the option to copy Fastpass+ reservations to others in your party, whether they’re in the same room or just at the Park at the same time. It makes that process much easier. By doing all of these things, it made our interactions with MyDisneyExperience once we got to the parks better, though not without issue entirely. Have you tried MagicBands yet? What did you do before you left for your Disney World trip? Get ready for it… here is comes… I know the anticipation was killing you and here it is in all it’s glory: Thursday! And that means My Favs on Thursdays! Make sure you check out Katy and Nicole to see what they’re favoriting this week! This week I want to introduce you to Rack It Up. It’s worthy of being your favorite thing too. Collect your favorite items in your virtual dream closet. Sit back, relax and wait for us to email you when any item in your closet goes on sale. I already get what I would consider a bunch of spam emails that send me entire lists of sale items at store websites. Do I ever look at them? No. Most of it is not my size or not my taste or still not in my price range. Rack It Up solves all three of those issues, and more. Plus, you actually DO get an email notification when the item goes on sale! Dreams do come true! Fill out all the boxes. The “Notify me when” box has three options: if the item is on sale, if the item has dropped a dollar amount, or if it goes a percentage off. It is then “racked” in your virtual closet! You can follow other users closets and rack items from their closets too. If the price still isn’t what you’re looking for, you can go in an edit the “notify me when” box to suit your needs. 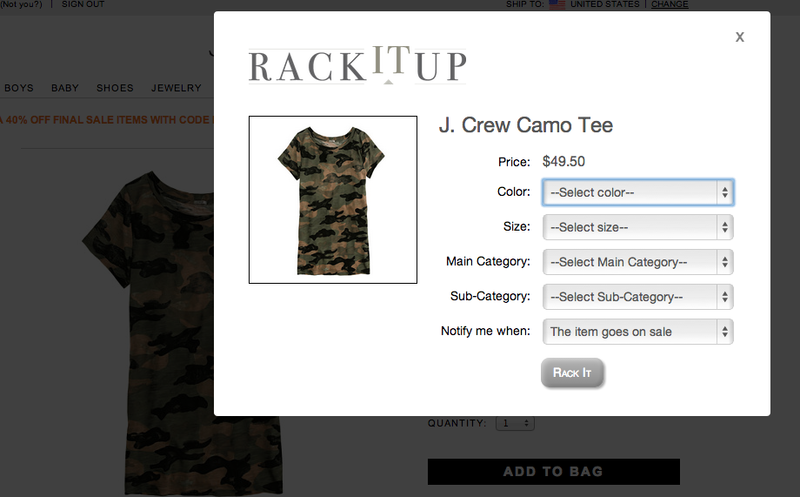 For me, Rack It Up fills the void that Pinterest and Polyvore left me with. 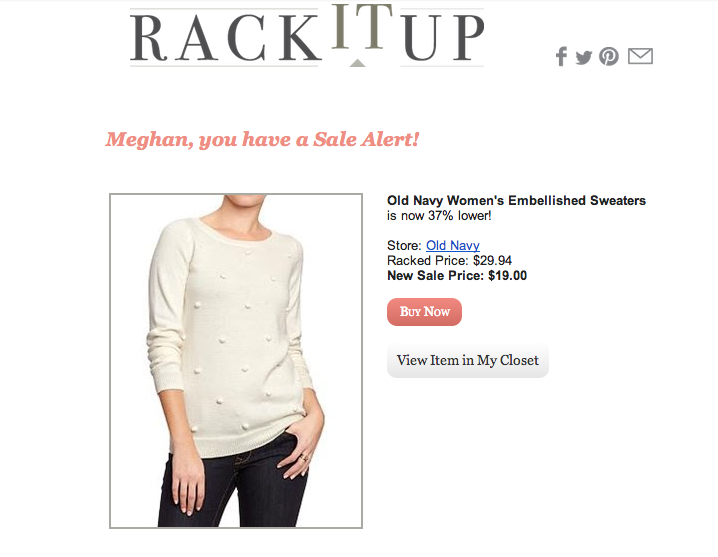 Collages with Polyvore, picture lists with Pinterest, and now letting me know when I can afford the item with Rack It Up. Perfect, no? I thought so too. Head on over to Rack It Up and start racking up the savings those spring wish list items! (I just had to… pun TOTALLY intended.) Leave me your member closet web address in the comments so I can follow your closet. If you read this blog, I already know you have fabulous taste. What are you favoriting this week? Nicole, Katy, and I would love to know. It’s that time of the month again! 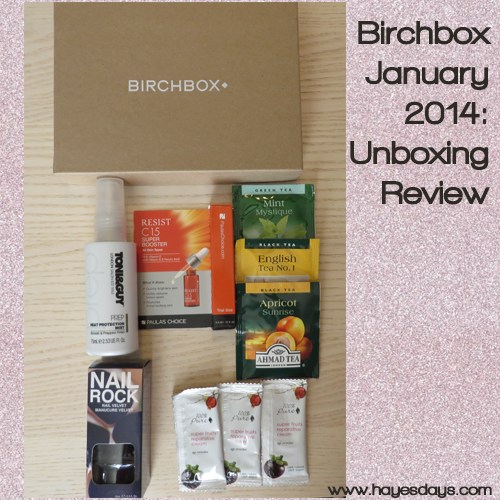 January Birchbox Unboxing. Sorry I’m so late and so absent this week! Stomach bug has been tearing through the Hayes family. Thankfully, today is better for me (but worse for my father-in-law). Without further ado, here are the five items I received this month and my initial thoughts, as well as my final thoughts on December’s items. 100% Pure Body Cream: It’s 100% natural and 100% vegan, which is not my main criteria for purchasing something, but it is a great quality for the product. I don’t like that it comes in a ketchup packet. It’s hard to get the lotion out and it looks cheap. The lotion smells overwhelmingly like blueberries. That could be good or bad depending on how much you like blueberries. 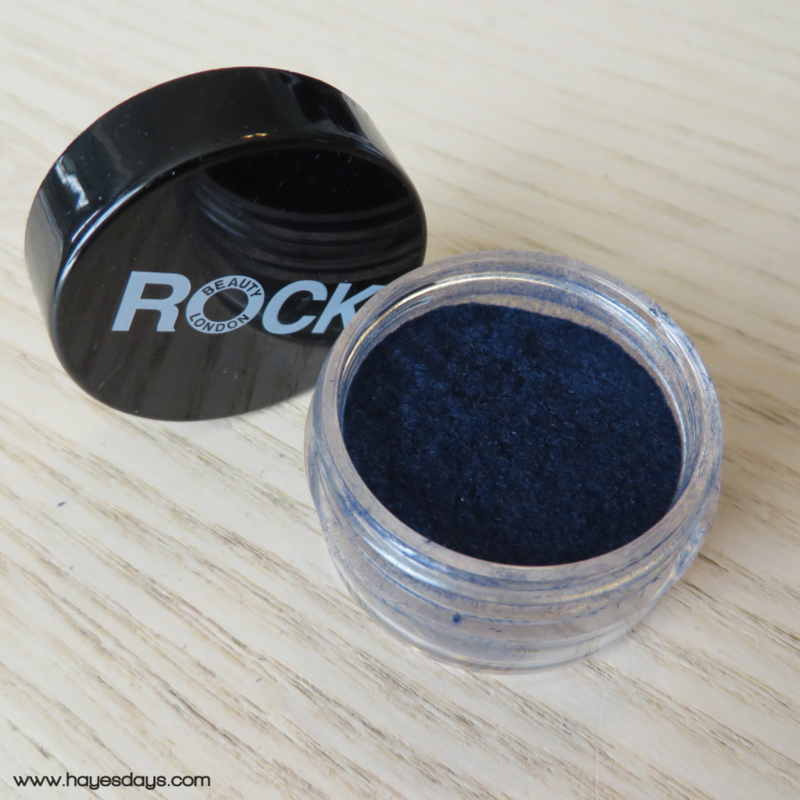 Nail Rock: This is the item I’m most excited to try. It’s navy velvet dust to put on your nails. It’s gonna be messy, but I can’t wait! I Also love the base color. Its a saturated navy, which I needed anyway. 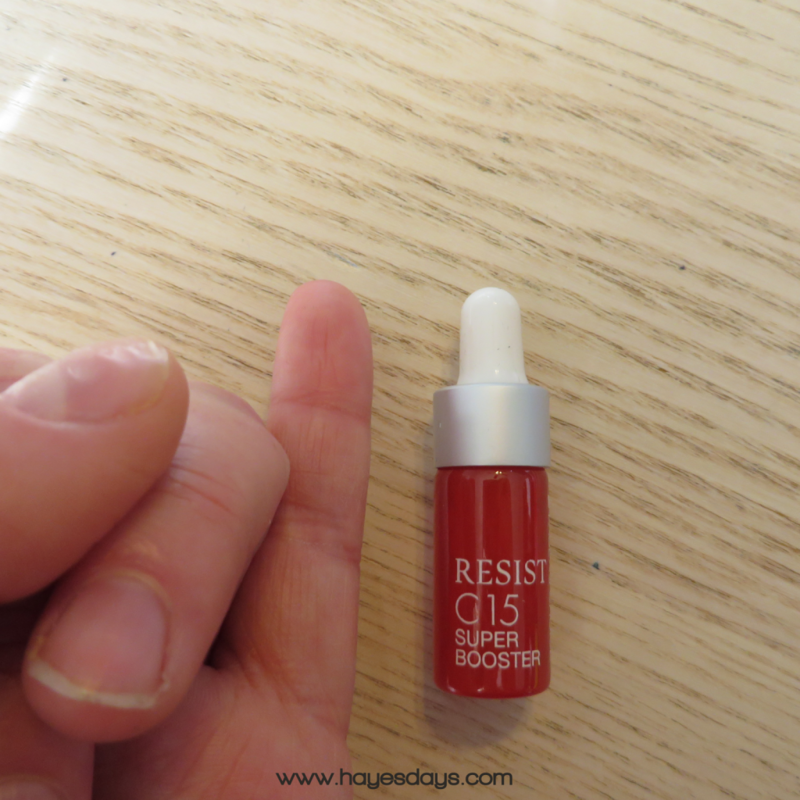 Paula’s Choice Resist C15 Super Booster: When I saw the box and looked at the recommendation to try it mixed in with your normal daily moisturizer, I was more excited about trying this product. Then I opened the box. It’s price is high and the trial size is .12 oz. I don’t know if that’s going to be enough to tell a difference. Toni&Guy PREP heat protection mist: So far, each heat protection product I’ve gotten from Birchbox has not worked better than my current product that I LOVE! The smell of this one is very salon chemical smelling. Not overwhelming, but enough that if it lingers around, I’ll definitely have a headache. Ahmad Tea London: Two UK items in this box. As much as I am a fan of tea, I’m also a creature of habit and love the teas I already drink. I’m not excited to try these teas. Plus tea was recently the lifestyle extra in the November box. This spot could’ve been better tailored to getting fit I think, and no, not another twistband, but something genuinely new. I would have loved to received something that relates to my work out, instead I got more tea. Boo. The Half Up hair tool is amazing! I use it at least once a week, usually on damp hair and sleep in it. I get massive curls in the morning. I have too much hair to use it for a full on bun, so I’m seriously considering getting the larger size one. I only wore the lip gloss three times before I just gave up. I really wanted to like it, but my chapstick did the same thing this lip gloss did, but with better moisturizing results. I used the hair style product while in Orlando to fight frizz. It did a great job and was already in that fantastic sample size. I don’t know if I’d purchase the full size for all the time use though. I used the facial cream ONCE. It was a really small size and was supposed to be a moisturizer, but it broke my face out. It was not for me. We’re not giving that pretzel anymore time. Least favorite lifestyle extra ever. Next month check back to see what my final thoughts were on January’s box and see what I got for February! Let me know what you got in your box! 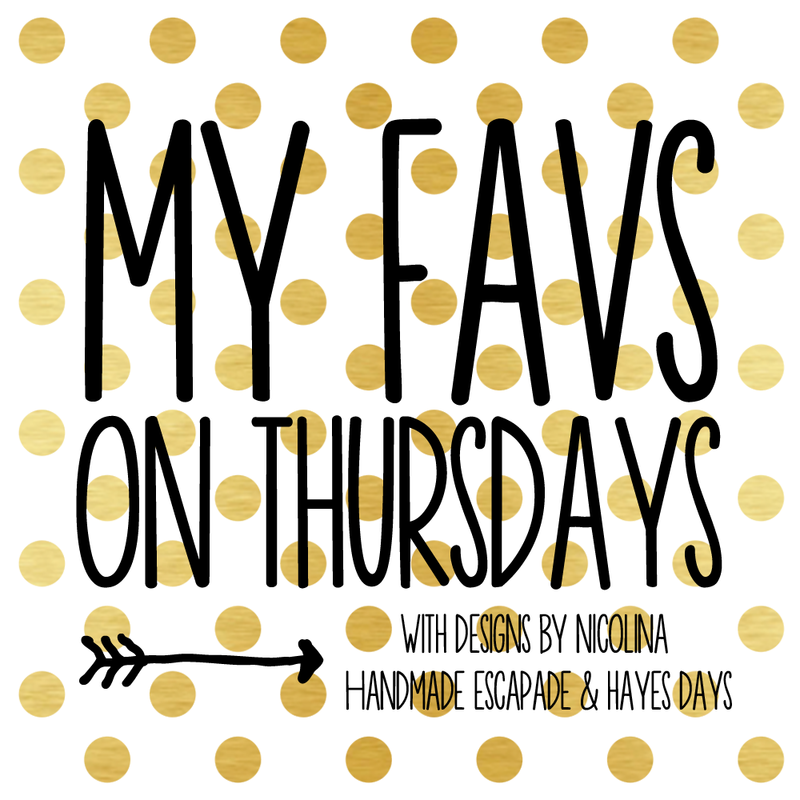 Linking up with my favorite ladies, Nicole and Katy for My Favs on Thursdays! You may (or may not have) noticed that I installed a new template over the weekend. Just like my interests change from day to day, what I want my blog to look like changes too. Though I loved my other template and the unique blue background, that’s exactly what made me want to change it. Most of the buttons and graphics I wanted to use had white backgrounds. When I would insert them, those graphics didn’t look as seamless as I wanted them to. Enter 17th Avenue. Kate Johnson is the owner and designer behind all the templates, graphics, and amazingness over at 17th Avenue. Her templates are affordable and adorable. I can change the template to another one of her cute designs a few months from now and not be upset with myself for the money spent. The instructions are very straight forward, making it very easy to install. 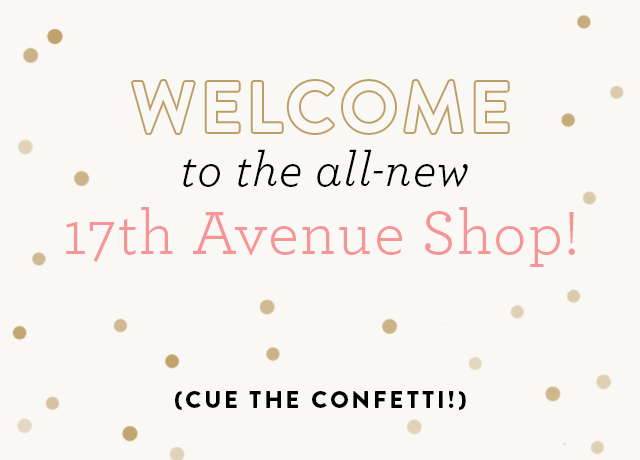 If you’re looking for a face-lift for your blog (or just a little rouge) check out the pretties at 17th Avenue! You can shop directly at http://17thavenuedesigns.com/about-us/ or at the etsy shop https://www.etsy.com/shop/17thAvenueDesigns. See two other 17th Avenue designs in action on Katy and Nicole’s blogs as well. Make sure to see what Nicole and Katy are favoriting this week and share with us what you love!